While some are enjoying last moments of summer at beach we won’t hesitate to bring sand for our own beach in a Minecraft style. 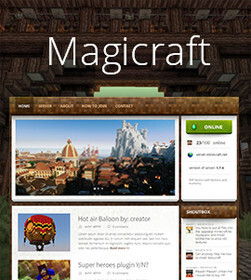 New sand skin for Magicraft is here and looks great, yeah and it’s also for FREE. Bring sand to my theme now. Well, you need FTP client and of course access on FTP. When changing skin you have two possibilities. Change colors to match the skin. With every skin we deliver set of colors that fit best with the graphics. By checking the checkbox you can set them all as actual. Don’t change colors. It is possible that you have set your own colors and only want to change the skin texture. It is possible if you leave checkbox unchecked. Anyway, you can still go to customize->Colors section and click on any color, if you hit default now, it will be default color of active skin.